2 Club Med All Inclusive Resorts. 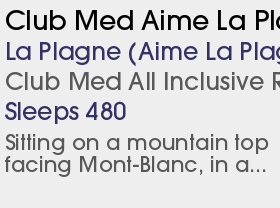 Set high in the magnificent Savoie French Alps, dominated by the mighty Mont Blanc, Aime La Plagne is one of the newest and more secluded resorts in the most famous and exciting high altitude ski area in the world. One of the first purpose-built resorts in France, La Plagne comprises ten ski centres, each with shops, restaurants, ski schools and children's village, with direct access onto the ski area. The villages are well-connected and gondolas and a bus service run between them. Skiing has taken on a new dimension with the introduction of the Vanoise Express cable car combining the two areas of Les Arcs and La Plagne on the Paradiski lift pass. La Plagne boasts possibly the biggest single resort lift system in the world and has superb and extensive runs for all grades of skiers and boarder. Beginners can slowly find their feet on the 11 green slopes, before progressing to the more gentle blues and try their hand at a bit of off-piste before the week is up. Intermediates can clock up the miles, whilst experts can take on some truly terrifying off-piste. Paradiski is vast but its intricate network of variously graded runs mean almost all levels of skier can take themselves from one end of the resort to the other and return back to their chalet with a real sense of achievement. Plagne Centre is where it all started forming the focal point of subsequent development, standing at an altitude of 1970 metres above sea level in the centre of the ski area, surrounded by woods and bathed in sunlight. The chalets in this area enjoy convenient access to the skiing. The main skiing here is all between 2,000 and 2,700m. Main access to the slopes is via the Grand Rochette Funiplagne cable-car, which whisks you up to 2,500m. From the top, there is a whole host of options, from steepish, crowded reds to wide scenic blues. The other main lift out of Plagne Centre is the Becoin chair up to Biolley at 2,350m, which gives access to a steep red back down or to some more daunting blacks. 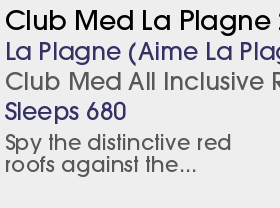 In terms of apres ski Plagne Centre is one of the better villages in La Plagne with a choice of bars and clubs including Le King Cafe and Le Must Disco. In its numerous malls, you will find a wide variety of shops, restaurants and other sources of amusement. 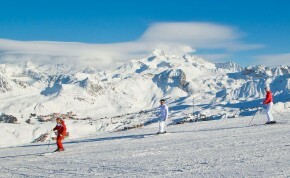 The resort stands in a superb natural setting, with a view across to Mont Blanc. It is the place for innumerable sporting and leisure activities, with something to suit all tastes. The long, slow Crozats quad chair on the Montchavin side of L’Arpette will be replaced by a smart new six-seater carrying 3,600 people per hour. And new public toilets will be built at the top. The Plan Bois beginner area above Montchavin-Les Coches will be improved. The existing draglift will be replaced by a new moving carpet lift and a new draglift around 500m long will be built to allow beginners to reach the Lac Noir gondola and Plan Bois chairlift to ride back down. The beginner area will be fitted with more snowmaking. A new gourmet restaurant seating just 35 people is opening in Plagne-Montalbert and will be run by British chef Phil Howard who won Michelin stars at The Square and then Elystan Street in London. A new 6-seater chair lift, Les Envers, opened from the valley between Le Fornelet, the low peak above Montalbert, and Plagne Aime 2000, further improving access from Montalbert to the central resort areas. This is more or less in the same place as the Coqs chair, removed some years ago. Presumably the lift co realised that sending everyone down the tricky blue run to La Roche wasn t such a good idea after all. The runs on the glacier are no longer groomed, increasing the area s appeal for adventurous skiers (and meaning these slopes can be opened more quickly after a dump). A family fun run opened at the top of the St Jacques blue piste, in the Bellecôte sector; it has features such as tunnels, jumps, raised bends and bridges. Chauffe Marcel opened on the slopes above 1800 sounds a bit like a Folie Douce, with DJs ‘playing electro and pop’ from 3pm. Our location maps are intended as a helpful guide but are by no means definitive. Please confirm chalet locations with our team prior to booking.